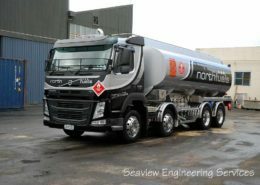 Specialist Fuel System Design: With our years of industry experience there is no fuel transport and handling problem that we cannot design a solution for. 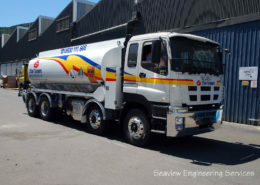 We have developed innovative fuel handling solutions for demanding military and aviation clients. 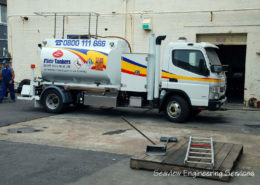 Independent registered engineers validate our designs to the required standards, where required. 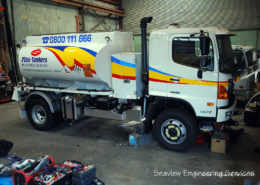 Specialist Welding and Vehicle Fabrication: Including new chassis building, chassis extensions, 5th wheel installations, drawbars, drawbeams and tank remounts – all to the highest industry standards. Final assembly and certification: We ensure everything on your vehicle is ready to start delivering fuel, including all necessary certification. We’ll even make your driver a cup of tea to send him on his way. 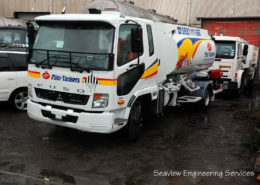 Testing and inspection: We are strategically located in the Seaview Transport Hub just 2.5kms from the Seaview Terminal, where we can provide a rapid, on the spot, comprehensive testing and inspection service including tank top testing, 2 year in-service tanker inspection tests, and safe loading passes.